Buy 6 doses of Activyl, get $15 back! Buy 12 doses, get $35 back on/before 12/31/18. $10 savings on 6 months, $25 on 12 months! ElancoRebates.com on/before 12/31/18. Buy 12 months, get $12 back! Free heartworm test with purchase of 12 months. Buy 12 doses, get $20 back! Receive a free heartworm test with purchase of a 12-month supply on/before 12/31/18. Buy 12 months, get $12 back! on/before 12/31/18. Free heartworm test with purchase of 12 months. Every dog is at risk for getting heartworm disease, a potentially deadly condition. Fortunately, prevention is easy with Heartgard Chewables or Heartgard Plus (ivermectin/pyrantel), because dogs prefer the taste of these Real-Beef Chewables. Given once a month for life, Heartgard or Heartgard Plus helps ensure your pet has guaranteed protection from deadly heartworm disease. Heartgard Plus also treats and controls hookworms and roundworms. Heartgard is well tolerated. All dogs should be tested for heartworm infection before starting a preventive program. Flavor Tabs are a monthly oral preventive that guards against heartworms (Dirofilaria immitis) and fleas as well as adult roundworms (Toxocara canis, Toxascaris leonina), adult hookworms (Ancylostoma caninum) and whipworms (Trichuris vulpis). As with other heartworm preventives, dogs must be tested for heartworm prior to using SENTINEL Flavor Tabs. In a small percentage of treated dogs, digestive, neurological and skin side effects may occur. Advantage Multi® (imidacloprid moxidectin) Topical Solution is to be administered monthly, and when applied directly to your pet’s skin, prevents heartworm disease, kills adult fleas and controls flea infestations, and treats and controls intestinal worms. K9 Advantix is formulated to effectively kill and repel fleas, ticks and mosquitoes on your dog. Kills most fleas within 12 hours of application. Use once a month on your dog and treatment is waterproof. Package contains four treatments. Do not use on cats. Controls fleas and ticks for dogs and cats. Frontline Plus offers long-lasting flea and tick control, killing up to 100% of fleas on your pet within 18 hours and up to 100% of ticks on your pet within 48 hours. Best of all, research confirms that Frontline products work for an entire month to help keep your pet flea-free. Comfortis® Chewable Flea Control Tablets are a tasty way of killing adult fleas on your dog or cat, as well as preventing flea infestations for a whole month. Comfortis® will start killing fleas within 30 minutes of administration, and kill 100% of fleas within only 4 hours. Also registered for the treatment and prevention of Flea Allergy Dermatitis. And, because Trifexis is given orally, you don't have to isolate your dog from other pets or children. CAPSTAR tablets are safe for use in dogs, puppies, cats & kittens 4 weeks of age and older and 2 pounds of body weight or greater. A single dose should kill the adult fleas on your pet. If a re-infestation occurs, you can safely give another dose as often as once per day. Capstar is administered orally and begins working within 30 minutes. Each package contains 6 tablets. Activyl is a highly effective innovation in flea treatment that works through bioactivation by using the flea's own enzymes to fully activate its insecticidal power. Select One Activyl for Cats 2-9 lbs - 6 dose pkg. 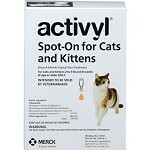 Activyl for Cats over 9 lbs - 6 dose pkg. Activyl for Dogs 14.1-22 lbs - 6 dose pkg. Activyl for Dogs 22.1-44 lbs - 6 dose pkg. Activyl for Dogs 4-14 lbs - 6 dose pkg. Activyl for Dogs 44.1-88 lbs - 6 dose pkg. Activyl for Dogs 88.1-132 lbs - 6 dose pkg. From the makers of FRONTLINE Plus, the #1 choice of veterinarians,2 now comes the first flea and tick killer in a beef-flavored chew. 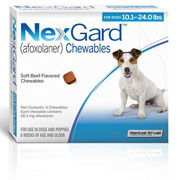 NexGard for dogs kills adult fleas before they lay eggs. Plus, it kills the American Dog Tick. All in a delicious, softchew that dogs love. Sentinel Spectrum offers your dog all-in-one protection against fleas, all major intestinal worms (treating hydatid tapeworm and flea tapeworm) and heartworm. Dogs of any age, even older dogs, can become infected with heartworms, roundworms or hookworms - but it's easy to protect your dog! 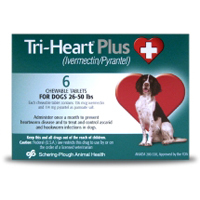 Tri-Heart® Plus flavored chewable tablets contain ivermectin/pyrantel - a proven combination to protect your dog and ensure your complete peace of mind. Tri-Heart® Plus is an affordable prescription and all it takes to prevent parasitic infestations that can literally rob your pets' vitality and shorten their lifespans. BRAVECTO is a tasty oral chew that gives your dog up to 12 weeks of protection against fleas and ticks. For cats, this product is topical, not oral. It provides broad-spectrum and long-lasting protection which starts killing fleas within 2 hours and treats and controls 4 tick species. BRAVECTO is a tasty oral chew or topical cream that gives your dog up to 12 weeks of protection against fleas and ticks. For cats, this product is topical, not oral. It provides broad-spectrum and long-lasting protection which starts killing fleas within 2 hours and treats and controls 4 tick species.